While handling chemicals safely is a serious business, it doesn't mean chemists don't know how to have fun, too. Chemists form a global community and do all kinds of fun things, from making dynamic Periodic Tables to videos of the elements. ​During your undergraduate studies, a bit of chemistry fun can help get you through organic chemistry or thermodynamics. 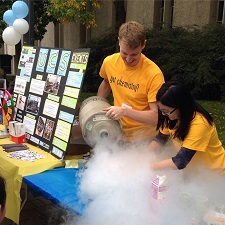 The Undergraduate Chemistry Society organizes a series of social events during the term, like "2 Bucks-a-Beaker", "Faculty Meet and Greet:, "Chemistry Lab Tours", and the "Chemistry Forum". 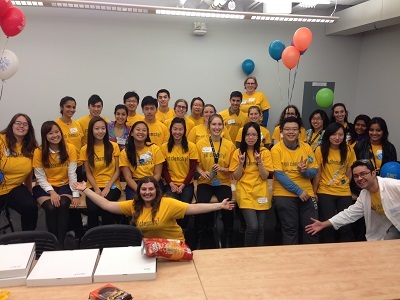 Become a member of the UCS and you can commune with like-minded students with an interest in both chemistry and fun! 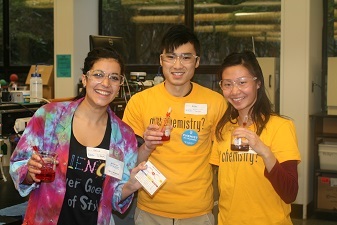 If you like performing in front of people, you might consider volunteering for events held in the Department, like the Annual Chemistry Open House. 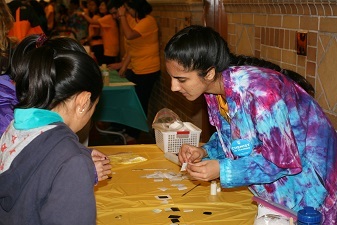 Whether you are performing centre stage in a "Magic" Show or fostering a child's curiosity in the Hands-on Experiment Lab, your passion for chemistry can become infectious. Audiences always love seeing chemical demonstrations, especially ones producing neat colours, or glowing solutions, or better yet fire or small explosions. You can be the center of attention during these performances. Finally, seize the chance to meet and network with fellow undergraduate chemists from all over Canada by attending conferences such as the Western Canadian Undergraduate Chemistry Conference, or by participating in exchange programs such as ICE (Inorganic Chemistry Exchange) or RISE (Reactive Intermediates Student Exchange). These opportunities provide undergraduate students with a glimpse of life as a graduate student or research chemist, and serve as a platform for long lasting friendships and collaborations.